I’m delighted to announce the publication of The Search For the Stones (Artscroll) by Shmuel Blitz, Zakon, and my friend Marc Lumer, Illustrator. A quiet family vacation in Jerusalem turns into high adventure as Ilana and Ari Goldreich set out on an unforgettable quest through time. Sent on this mission by a mysterious man in white, and pursued by an evil man in purple, they must face danger - and learn lessons of friendship, courage, and other Jewish values - in order to save the world from deadly peril!Ari and Ilana will pan for gold in California during the Gold Rush. They will face the dreaded Spanish Inquisition, search for Nazis in Brazil, and help bring a huge stone to build the Holy Temple. An evil man in a purple cloak will use all his powers to stop them, while the man in white will teach them about true loyalty and the power of giving to others. Attention Middle School Students - Jewish Heritage Writing Contest! Association of Jewish Libraries Jewish Heritage writing contest for kids in grades 6-8! Check it out! I am thrilled to welcome Zachary Shapiro to the blog. 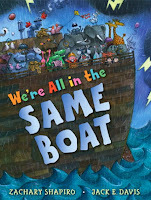 His first children’s book, We’re All in the Same Boat (Putnam), is a delightful retelling of the story of Noah’s Ark, beautifully illustrated by Jack E. Davis. Zach has inspired people of all ages through original story-telling, music and heartfelt humor. As the Rabbi of Temple Akiba in Culver City, California, Zach finds many ways to bring new life to old legends. He wrote We're All in the Same Boat to teach children and adults how we can motivate and support each other in the face of tough circumstances. A native of Massachusetts, Zach Shapiro lives in Southern California with his partner and their dog, "Daisy," who has barked her share of complaints on a rainy day! What was the inspiration for writing We're All in the Same Boat? A few years ago, my sister-in-law, Leora Krygier, published her novel, "First the Raven." At one of her readings, she described how the raven was the first bird to fly free from Noah's Ark. And in relating the drama of the book, she used the phrase, "We're all in the same boat." At the moment, something stirred in me. Noah had always been a favorite story, and I loved making it come to life with children. And so, I began to think about the tired, restless creatures on Noah's Ark, from the ants to the zebras. I went home that night and wrote the first draft of my manuscript. Can you share a bit about your writer's journey? In my work, I tell stories all the time. But writing stories was a new animal (pun intended). I had always dreamed of writing a children's picture book, but I really had no idea about the process. So I went out and bought "The Everything Guide to Writing Children's Books." I read it cover to cover. In the back is an index of publishers, and I researched each of them on line. I made lists of which publishers would be appropriate for my book. And I considered whether the book should specifically target the Jewish market or not. And so, I carefully selected a handful of publishers, prepared cover letters, and send out my manuscript. And I waited. And waited. And waited. And I was rejected. Many times. But all it takes is one. And when I got a response from Putnam, I leapt for joy! The illustrations in We're All in the Same Boat are delightful. What was your response when you first saw them? When Putnam first told me that it usually takes 2-3 years for the book to hit the shelves, I nearly plotzed. It seems liked forever. But they insisted that we find the right illustrator. When I learned that they had selected Jack E. Davis, I was thrilled. A full year went by before I saw Jack's first sketches. And though I adore Jack's art, I didn't know what to expect. I was a little scared. But my nervous anticipation transformed into delight. I could never have begun to imagine such amazing illustrations, and I am in awe that an artist can convey words like, "Vexed" and "Impatient." How has your congregation reacted to your book? To launch the book, I worked with Temple Akiba to host a premier reading along with a "blessing of the animals." We encouraged members and guests to brings their pets to synagogue after Sunday School. Our front courtyard was filled with dogs, cats, bunnies, frogs, and even a snake! After the reading, I offered a special blessing for the joy that our furry friends bring to our lives each day. Later in the year, our Nursery School embarked on a Noah's Ark project that received an award from the Bureau of Jewish Education. Young and old alike have been so enthusiastic about "We're All in the Same Boat." We have sold over 200 copies through our gift store alone. I grew up in Boston and have lived in the Los Angeles areas since my ordination from the Hebrew Union College - Jewish Institute of Religion in 1997. I was the Associate Rabbi at University Synagogue in Brentwood for eight years before becoming the Senior Rabbi at Temple Akiba. My goal in life is to help bring goodness into the world, one act of purposeful kindness at a time. I am big aviation fan, and I have a vast library of books about commercial aviation and airports. I love to bike ride and I enjoy good theatre. 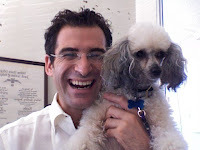 My partner, Ron Galperin, and I have a poodle named Daisy. Who knows... someday you may be reading a book about her as well!